The design & production hours often entail at least the equivalent of two, three or more weeks work. Though those hours may be extended over many more weeks. This usually depends upon what other jobs a designer may have on and how quickly a customer responds with feedback. A set of icons for use on a mobile phone. Need to be clear in their meaning and will be required in small, smaller & smallest sizes. Icons for signage are larger and will need to accomodate various lighting conditions. They may need to be recognisable while the audience is moving. All icons must be clear in their meaning. Somtimes that meaning is specific to it’s context. Such as in a factory or a large institution. There are other contextual matters the designer must consider. Such as the viewers position of sight. An icon at ground level should look similar to the same icon on the ground or high on the side of a building. Now factors such as forshortening/ perspective/ distortion take effect. An icon at height in order to appear as the same at eye level has been drawn with some alterations. It is not a matter of just enlarging the icon. Yes we have seen this done & it looks odd. To read properly the top of an icon should be wider than the bottom. Widths vary from that at eye level beyond being larger. Perhaps you are familiar with the on street signage. The yield text painted on the road is long and thin. Because as we approach it in a car the human brain foreshortens the word. 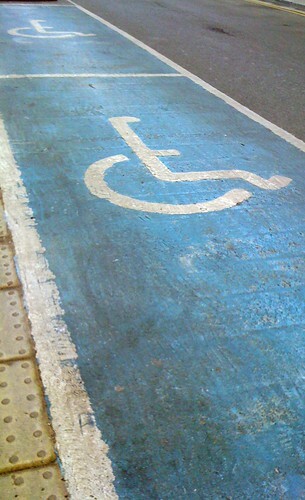 Another obvious example is the disabled wheelchair symbol have you wondered why in some parking spaces it’s long and thin while on another it might appear two short in proportion to it height. The icon is drawn to accomodate the angle the driver is expected to approach the parking space at. This consideration should also be taken when designing an identity, whether a logotype or symbol to identify an enterprise, organization or individual. The difference between an identity and an icon is that an icon is a symbol for an action or an idea that needs attention drawn to it. The content of icons unlike an identity is generally not to be unique; indeed they depend upon their familiarity or obviousness to share their message. Well! now you have an idea of why the Graphic designer is squinting at the signage.